After 60 hours of non-stop work, researchers at the University of Bern being part of an international team reached their hoped-for goal: They were the first to measure the orbital period for the outermost planet of the famous TRAPPIST-1 system which made headlines worldwide. The new result confirms that the seven Earth-size planets around the ultra-cool dwarf are lined up in a chain with resonances linking every member. «We knew that we had to be very fast to be the first ones», says Marko Sestovic, PhD student at the University of Bern’s Center for Space and Habitability (CSH). «If you are not the first, nobody cares about your effort», adds CSH postdoc Simon Grimm. NASA had started the global research race with announcing the public release of data about two months ahead of schedule. Its Kepler Space Telescope had observed the star TRAPPIST-1 from mid-December until early March. Previous observations with telescopes on the ground and in space had revealed that the ultra-cool dwarf is orbited by seven Earth-size planets, a larger number than detected in any other transiting exoplanetary system. 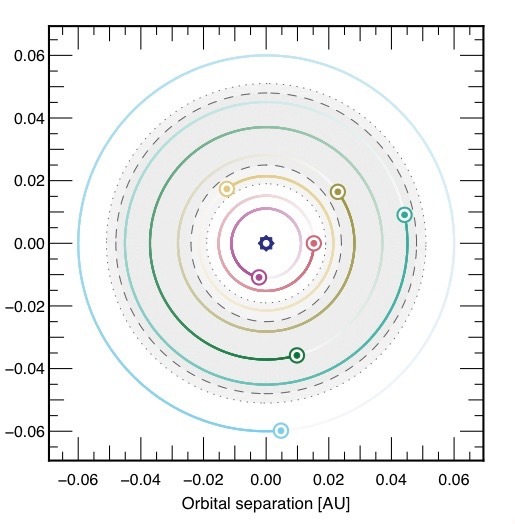 Whereas the astrophysicists could determine the orbital periods for the first six planets, the period of the outermost planet remained unconstrained. Only four days after the end of the Kepler observing campaign, NASA made the dataset publicly available. The researchers in Bern had already teamed up with colleagues at the University of Washington and other scientists in the US, Belgium, France, UK, Saudi Arabia and Morocco to be able to start work immediately. Simon Grimm had developed a tool to automatically download and process the data as soon as they were made available, whereas Marko Sestovic developed a pipeline to perform the data analysis. The same job was independently done by Rodrigo Luger, PhD student in Seattle. Normally, NASA calibrates the data of the Kepler Space Telescope in a lengthy procedure before public release, but this time the researchers got only the raw dataset. “Due to technical problems, the Kepler spacecraft is no longer able to maintain its pointing direction accurately, causing it to drift and jitter as its thrusters fight to keep it pointed at the star”, explains Sestovic: “This introduces strong instrumental signals and a lot of noise that must be removed. The noise can be several times bigger than the transit signal we are looking for”. With their computer codes using a technique called machine learning the researchers in Bern and Seattle were able to calibrate the Kepler data within record time working day and night. “Every hour counts when there is a risk of being scooped”, says CSH professor Brice-Olivier Demory. To determine the orbital period of the outermost planet called TRAPPIST-1h the researchers counted on theory. They had already found that because of gravitational interactions the periods of the inner planets were linked: For instance, if planet b orbits the star eight times, planet c completes five orbits, and planet d three – a phenomena called mean-motion resonance. If planet h was also in resonance with its neighbouring planets f and g, the period would have one of certain discrete values. Examining previous data, Brice-Olivier Demory as well as two colleagues in Seattle and Chicago were able to rule out all but one of those possible periods: 18.764 Earth days. “Remarkably, we found the planet in the Kepler data exactly where theory predicted”, says Demory. So, if planet h orbits TRAPPIST-1 twice, its inner neighbour g completes 3 orbits, and f four. “The fact that the period of TRAPPIST-1h was predicted by theory before it was found in the data reminds one of how Neptune was found more than 100 years ago”, says CSH director Kevin Heng. Because of irregularities in the orbit of planet Uranus, astronomers predicted the existence of an additional planet further out and calculated the position of the unknown object – Neptune. 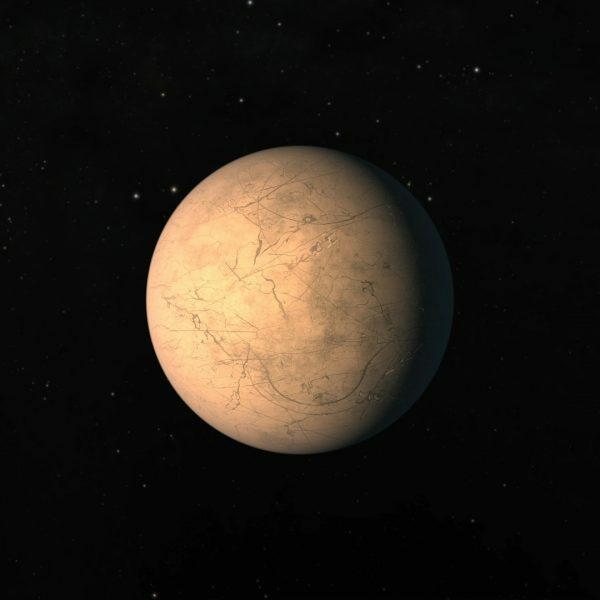 In addition to the period of TRAPPIST-1h, the scientists found that the temperature of the planet is 169 K, or -104 degrees Celsius and its radius is a bit smaller than the Earth radius. They also measured that the star itself rotates once every 3.3 days, and inferred from the low activity of TRAPPIST-1 that it is older than previously expected.